with artisans showcasing their talents, color and music. The Art Festival will feature 145 art & fine craft artists with displays of glass, jewelry, mosaics, paintings, photography, pottery, sculpture and more all available for purchase. Uptown Art Expo will also feature Chalk Street Artists creating mesmerizing chalk masterpieces on the sidewalks as their canvas presented by MIDFLORIDA Credit Union. Live music performances all weekend featuring Pablo Cruise with VIP and Meet & Greet Seating, along with international street cuisine and good old-fashion festival foods will be available. Shadrachs fiery traveling pizza, smokin j’s bbq and More! You are allowed to bring their own chair, blanket or cushion. No coolers or pets allowed. Embassy Suites is offering our artist’s a special Uptown Art Expo rate per night just $139.00 per night with breakfast package offer is good till Feb 22nd, 2019. Click Here! 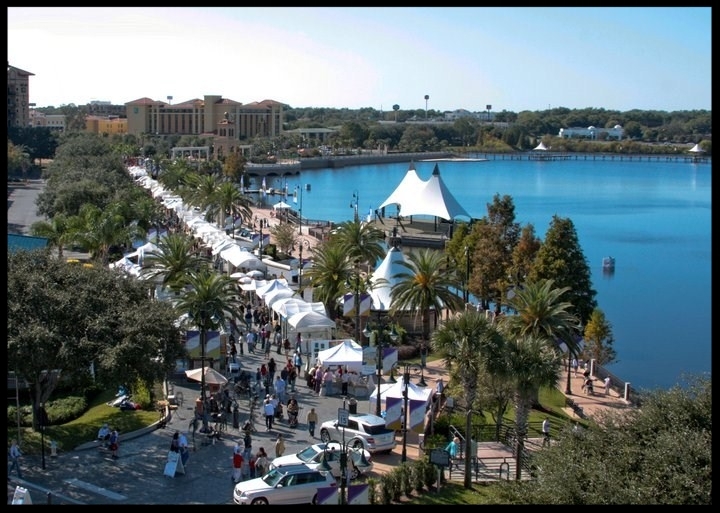 Uptown Art Expo is produced by Orlando Art & Living Expo, Inc., and is a non-profit corporation, whose mission is to bring art and music together, and enhance the quality of life in Central Florida. The lake is encircled by one mile of continuous walkway with benches and covered seating areas. Within the 45-acre park is a European-style Plaza which residents and visitors will note the cobblestone-style pathways, ionic columns, gathering areas with seating, themed lighting fixtures all ready for leisurely strolls, listening to music or just enjoying the beauty of the park. Opportunities are available for Festival Sponsors, Commercial Exhibitors and Food Vendors.